We take our nacho game very seriously around here. We eat them for dinner, as a snack…basically any time we have an excuse to shove them in our mouths. Last summer we were lounging around and Gavin wanted nachos. I said ‘everyone, stop what you’re doing and follow me into the kitchen.’ I told them I would be oh-so-proud if I could send them into the world as world-class nacho makers. I want them to go to college and be those kids that at midnight would be able to whip something up for their roommates at a moment’s notice, without making the kitchen a disaster. We talked about the importance of spreading the chips out evenly, making sure each chip is coated in cheese (but not too much, lest they get soggy) and you must (MUST!) put them on foil lightly sprayed with non-stick cooking spray so that A) your cheese doesn’t stick to the foil and B) clean-up is minimal. Because who wants to clean up? Ever? Needless to say, Gavin is nailing it in the nacho department. He deftly, like a boss, makes himself a tray on the weekend and then tucks back into whatever might be occupying his time at the moment. I think being a parent is about preparing your kids for the future…so I’m pretty psyched mine have one meal under their belt. Yes, that’s right, because nachos are officially a meal. We even recently created what we called ‘European Nachos’ with gruyere, parmesan and Mozzarella (because every last morsel of cheddar and jack had left the house). We were shocked…they were quite fab. My summer breakfast has been on repeat for months: that spanish-fried egg, smashed avocado + heirloom tomato number. Imagine my surprise (the horror?) when I woke up several weeks back with nary a slice of bread in the house. I spied several bags of tortilla chips in the cupboard and so I layered them (a mixture of blue and regular…for pretty color) in a cast-iron skillet, topped with shredded white sharp cheddar, fresno chilis + heirloom tomatoes + cilantro from my garden and then capped it all off with a Spanish-fried egg (I talk about Spanish-fried eggs here). As I inhaled I wondered why we hadn’t been doing breakfast nachos forever? Talk about a missed meal during my college days… Could you imagine anything better at 3 a.m.? This is next up on the kid’s learn-how-to-make list. I promised you quick meals this summer…and this is numero uno. 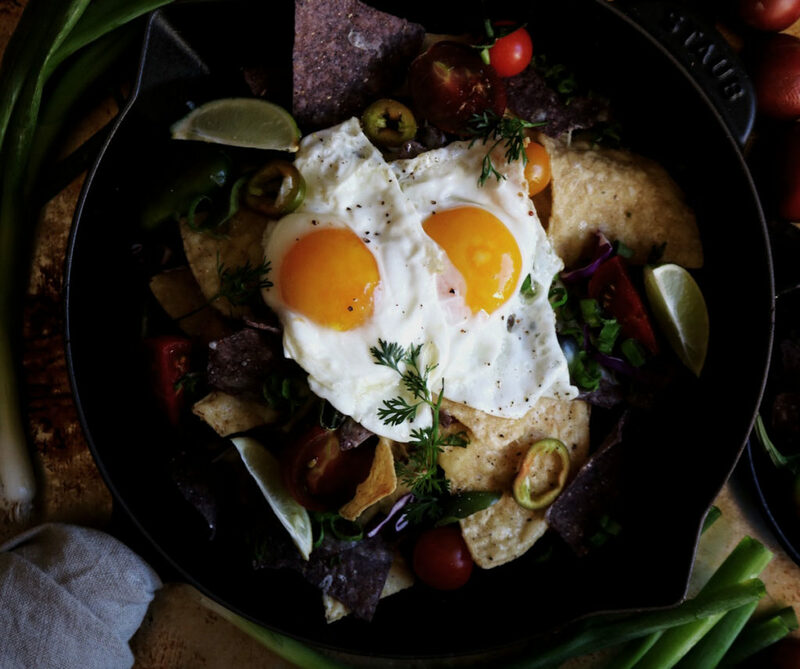 These breakfast nachos are begging for you to freestyle…so go ahead with your avocado, red pepper, purple onion-loving self. Other Ingredient Options: Thinly sliced purple onions, roasted red peppers, pinto or black beans, crumbled crispy bacon, avocado wedges, cotija cheese, fresh parsley leaves, Mexican chorizo, charred salsa, pickled radishes…whatever you shove on regular nachos, in burritos or omelets…start there. Crack your egg into a small bowl, taking care not to break the yolk. Have a small spoon handy. Heat a small, non-stick skillet over medium high heat. Add the 4 tablespoons of olive oil and wait for it to get hot. I mean hot. Put your cheese covered tortilla chips under the broiler for about one minute or until the cheese is melted. Set aside. Slide your egg into the hot oil and tilt the pan, taking care to keep it over the heat. Spoon the oil over the egg white to help cook the top white part of the egg. Should take no more than 1-2 minutes. To test the egg for doneness, flatten out the pan and check the area closest to the yolk for clear liquid jiggle. Sprinkle your nachos with the Fresno chili slices, tomato wedges and green onion. When done, slide the egg on top of the breakfast nachos. Finally, top with the cilantro leaves. Add sea salt and pepper to taste. Squeeze the lime over the top. 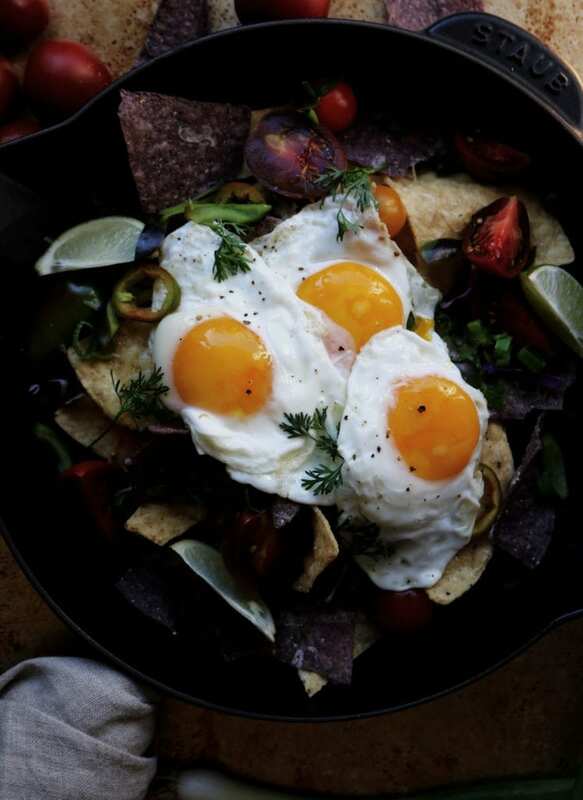 I like to eat breakfast nachos with a knife and fork…bear down on the chips to shatter and cause yolk spillage. It’s a messy, but worthwhile, eat. These would be AMAZING and beautiful on a brunch table. Perfect way to feed a crowd. Enjoy! *If it’s just for you and you don’t want a lot of clean up, line your skillet with foil and spray with non-stick. Just enjoying summer…I hope you are too. 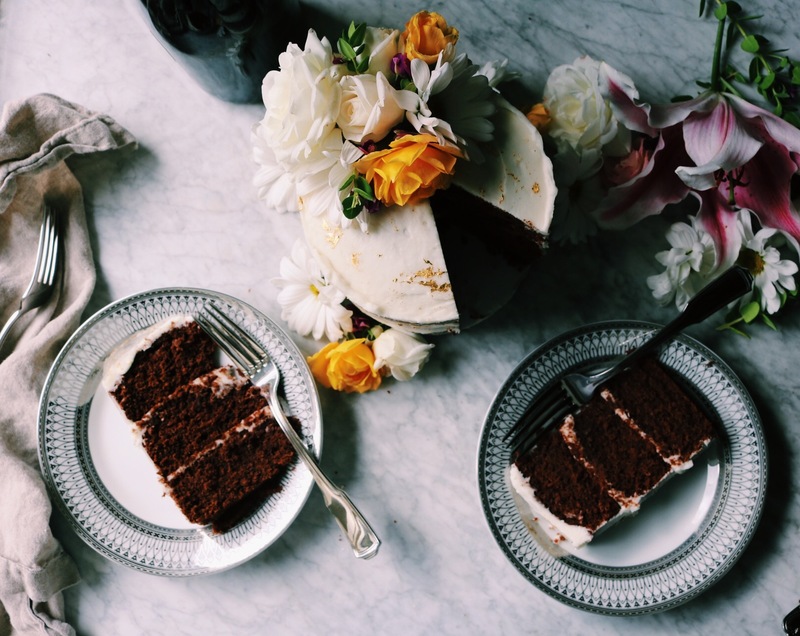 I have quite a few sweets and eats lined up, but if you have any requests please note them below or send me an email — I’d love to hear what you’d like to see on DisplacedHousewife. These aren’t chilaquiles, by the way. I would say maybe they’re chilaquiles adjacent. True chilaquiles would be made with us frying strips of corn tortillas and dousing them in a green or red sauce. And trust me, what I’ve just outlined above is quicker, easier and just as delicious! More Breakfast Grub: Olive Oil Fried Egg, Smashed Avocado + Heirloom Tomato Toast; Raspberry Cream Scones + Fresh Lemon Glaze; Fresh Strawberry Cream Scones; Chai-Spiced Granola; Whole-Wheat Buttermilk Pancakes; Blueberry + Maple Pancake Muffins; Boozy Blueberry Tangerine French Toast; Sugared Blueberry Lemon Coffeecake; Big Beefy Buttermilk Waffles and Overnight Cinnamon Rolls! THIS TIME LAST YEAR: Chocolate + Espresso Birthday Cake and Ricotta Salata, Baby Spinach, Charred Corn Buttermilk Pasta Salad (you’ll die). TWO YEARS AGO: Pear Coffee Cake; Fresh Tomato Crostata (this is so good…but need to reshoot the photos! ); Lemon-Rosemary Chicken + Tzatziki (a family favorite); Overnight Cinnamon Rolls (love…this is really just Alton Brown’s recipe with my instructions…); Lemon-Ginger Pavlova with Strawberry Sauce (seriously though, I need to fix the photos…but this is delicious); GF Chocolate Chip Banana Cookies (I totally forgot about these!!! 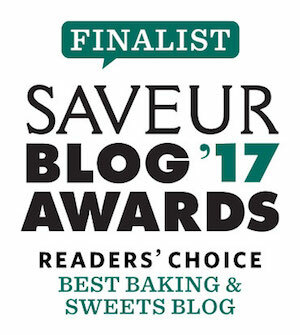 ); Lime Basil Vodka Mojitos (HELLO beautiful); and finally, my first post EVER: Curried Carrot Soup with Herb Yogurt Sauce….this is SO GOOD…hot or cold. Love. 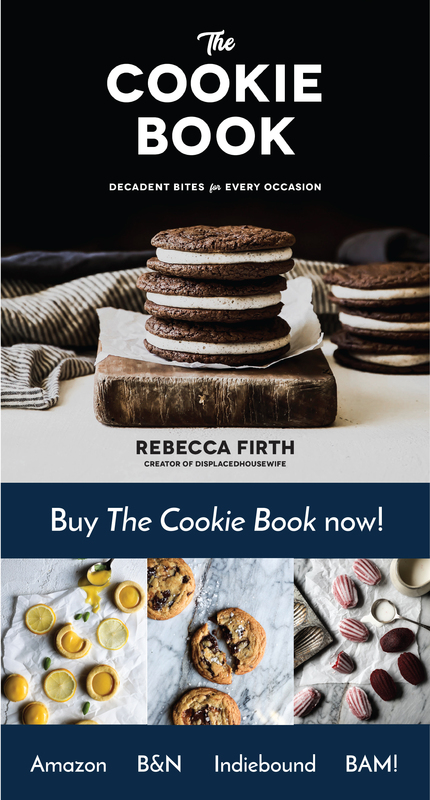 DisplacedHousewife Coupon Codes: Daily Harvest (code: rebecca) get your first three smoothies for free! 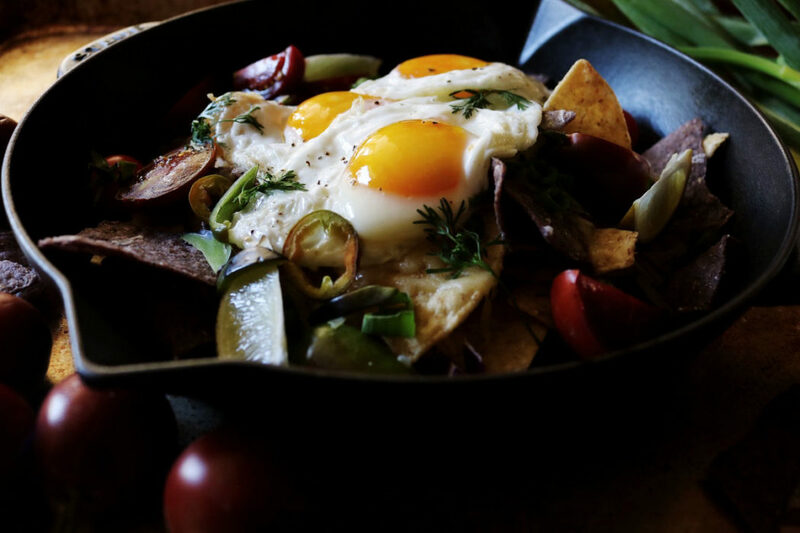 Yes to breakfast nachos! Like you, any excuse to eat nachos is a good one and a big YES to the cheese spread evenly. Share the love, right?? I’ve never had breakfast nachos before and didn’t know what I was missing until now. No seeding jalapenos for me….matter of fact, extra :) ! Love spicy stuff! I’m thinking these killer nachos are a must-make for dinner tonight! All that’s missing is that frosty margarita and I’m set! I’m embarrassed to say that I have not prepared my kids for the world of nachos. What kind of parents forgets that? Luckily there’s still time and we love nachos so they will get lots of practice. 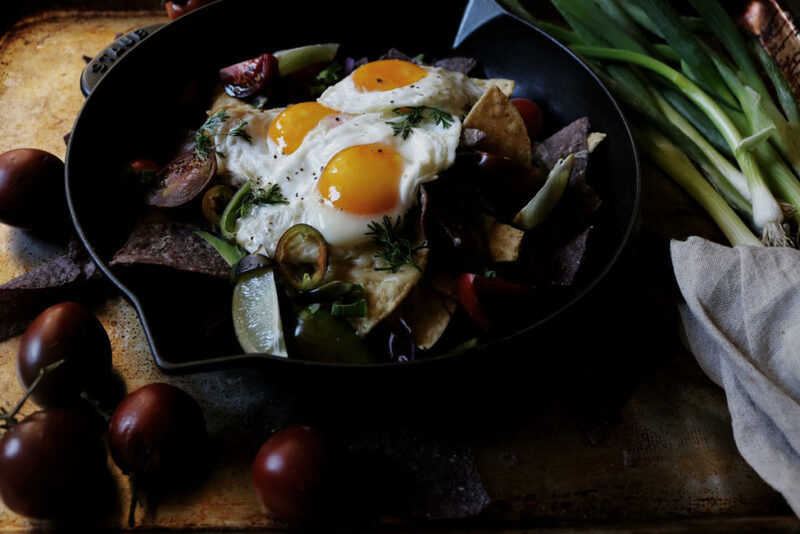 These breakfast nachos look crazy good! MB I would love to hear more about that cheese sauce…that sounds yummy!!! And yes, sausage would be delicious!!! ha. you are doing your kids a huge service and i applaud you. i’ve been working on super cheesy omelettes with my boys and we’re close, but not quite there. but they can separate their laundry into darks and lights so i’ll give myself a big pat on the back for that. so, clearly we’ll be making this for breakfast this weekend because, damn. Oh my goodness Rebecca! Gavin will be a hit when he gets to college! This is the perfect 3AM college meal for sure. Wish I had thought of it back then! It’s always a sad morning when I realize there is no bread in the house – so this is a brilliant idea, Rebecca. Nachos are an all time favorite snack and all your tips are right on – too many times people don’t get the chip to cheese ratio right. Looking forward to trying this. Have a great week! as a current college student, i would like to confirm the necessity of nachos. particularly at 3am after too much coding and studying.